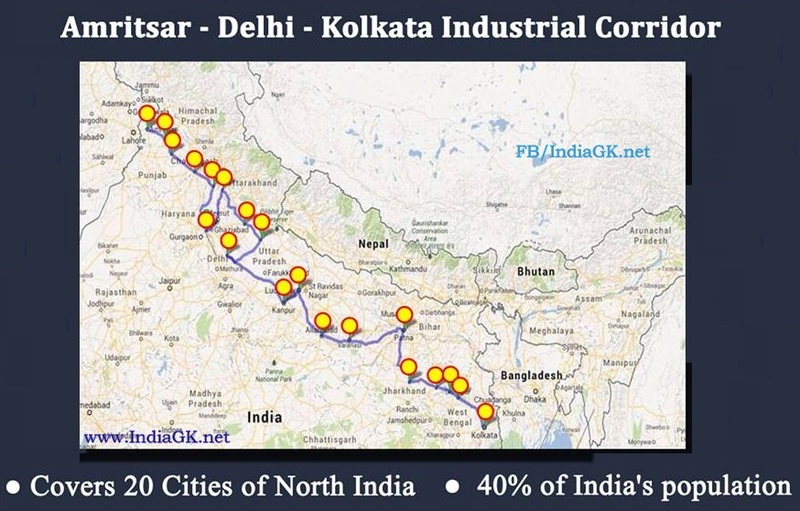 Amritsar - Delhi - Kolkata Industrial Corridor Route Map, Cities: In order to give a boost to industrial development in the densely populated states of Northern India, the Prime Minister has approved the commencement of preparatory work on creating an Amritsar - Delhi - Kolkata Industrial Corridor. The Amritsar - Kolkata Industrial Corridor is patterned on the Delhi-Mumbai Industrial Corridor (DMIC). The DMIC uses the Western Dedicated Freight Corridor as the backbone and is one of the most significant developments taking place in the sphere of industrialization. The DMIC has financial support from the Japanese Government and is expected to attract large investments leading to rapid industrial growth in Rajasthan, Gujarat, Haryana and Maharashtra through the development of new cities, industrial zones, and world-class infrastructure. In a similar manner, the Amritsar - Delhi - Kolkata Industrial Corridor will use the Eastern dedicated Freight Corridor as the backbone. The Eastern DFC extends from Ludhiana in Punjab to Dankuni near Kolkata. Therefore, the Amritsar - Delhi - Kolkata Industrial Corridor will be structured around the Eastern DFC and also the Highway system that exists on this route. It will also leverage the Inland Waterway System being developed along National Waterway - 1 which extends from Allahabad to Haldia. The Amritsar - Delhi - Kolkata Industrial Corridor will cover the states of Punjab, Haryana, Uttar Pradesh, Uttarakhand, Bihar, Jharkhand and West Bengal. This is one of the most densely populated regions in the world and houses about 40% of India's population. This is a region which needs a major push for industrialization and job-creation and the Amritsar - Delhi - Kolkata Industrial Corridor will act as a catalyst for this growth. The corridor will cover the cities of Amritsar, Jalandhar, Ludhiana, Ambala, Saharanpur, Delhi, Roorkee, Moradabad, Bareilly, Aligarh, Kanpur, Lucknow, Allahabad, Varanasi, Patna, Hazaribagh, Dhanbad, Asansol, Durgapur and Kolkata.